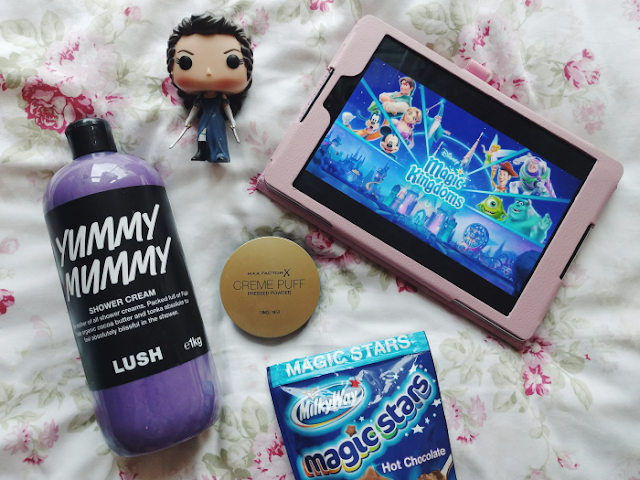 It's my monthly favourties time again, or how it should otherwise be known - everything I've been obsessing over on Twitter and Instagram this month! Not shown here: the copious amounts of Easter chocolate I'd been eating in the past couple of weeks... I think I probably ate at least five whole chocolate eggs before Easter Sunday had even arrived! 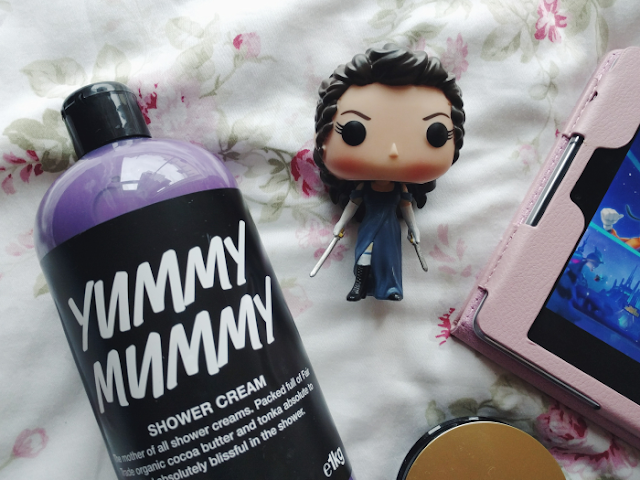 I bought a small bottle of Yummy Mummy to try at the end of February and it was instant love. It's a gorgeous, decadent sweet scent which the lady who served me at Lush described as smelling like 'salted caramel' and I have to agree! Unfortunately this is a seasonal product for Mother's Day so I obviously had to buy this 1kg whopper of a bottle to keep me going until next year! I've not talked about it on my blog before but I am a huge Jane Austen fan so when I heard they were adapting Pride and Prejudice and Zombies into a film I was very excited but also a bit nervous! There was a lot that could have gone wrong with this film and although it's not perfect, I actually really liked it. There was so much female badassery (GIRL POWER) and it was surprisingly funny, so as soon as I got home from the cinema I pre-ordered an Elizabeth Funko Pop to add to my collection. I'm so grateful that we finally have Austen-related Pops! 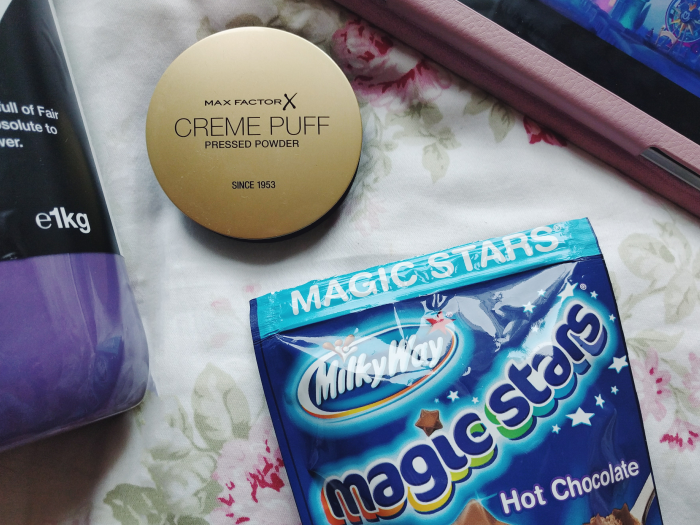 I bought this powder on a whim - I stumbled across it on Boots' website and it had really great reviews so I decided to give it a go and I'm so glad I did now because it makes me feel so much more confident about my skin! Having the remnants of my teenage acne, oily skin and dry patches makes it difficult to find makeup that agrees with my skin, however does everything I could want - it has very high coverage for a powder and it keeps oils at bay for far longer than my previous pressed powder did without drying out my skin! This has got to be my favourite supermarket hot chocolate. I love MilkyWay Magic Stars anyway but the hot chocolate manages to be deliciously chocolatey and sweet without being sickly, plus it has actual mini magic stars in it which I think is a super adorable touch! After seeing everyone on Twitter going crazy for this game I caved and downloaded it myself and I've been addicted ever since. Disney Magic Kingdoms was released earlier this month and it's a game where you can build your own Magic Kingdom and save it from the Villains who have taken over - it's not hard to see why it's been very popular in the Disney community! I put off downloading it first as I was worried it would get in the way of my university assignments (I've got my dissertation due in less than a month!) but luckily it's more one of those games that you have to check up on little and often, rather than spending hours straight playing it! 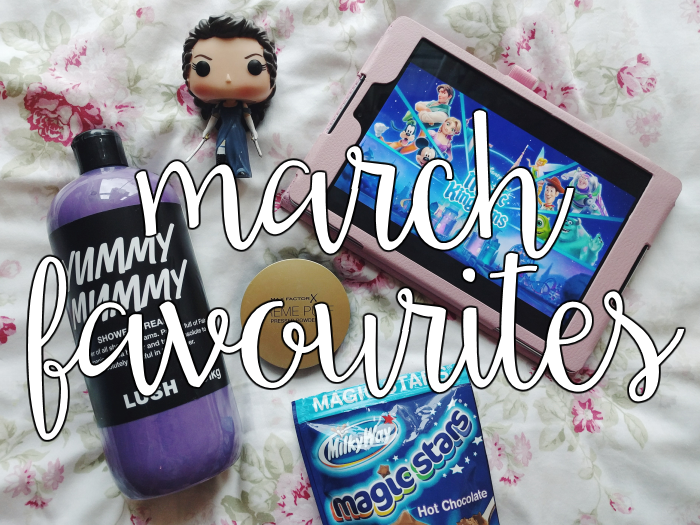 Have you tried any of this month's favourites yourself?